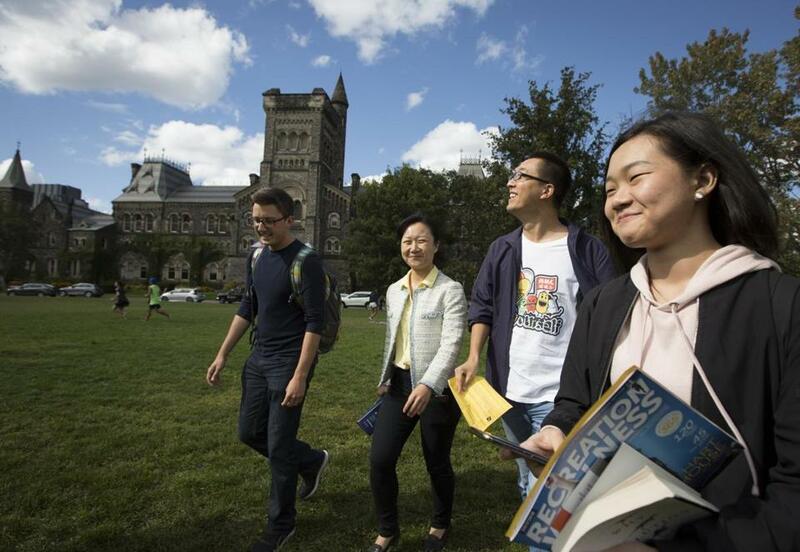 A group of students new to the University of Toronto walked across the lawn after a campus tour. TORONTO — Melanie Backal grew up in the bustling capital city of Bogota, Colombia, but for college she wanted to try something new. Her parents told her she would have a chance at a better future if she went to school abroad, and she agreed. She wanted to apply to Harvard. Then Donald Trump got elected president. Suddenly the United States didn’t seem so appealing. “All the things he said about Latinos, and everything that’s going on there, I decided to not take a risk,” said Backal, a first-year student at the University of Toronto. The United States has long been the top destination for foreign students who go abroad for college, but a record number are now choosing Canada instead. Some reasons are longstanding — fear of gun crime in the United States and cheaper tuition up north. But the 2016 election, and with it Trump’s travel ban and what many see as the demonization of foreigners and immigrants and a new wave of racism, has created a post-Trump surge at Canadian colleges. 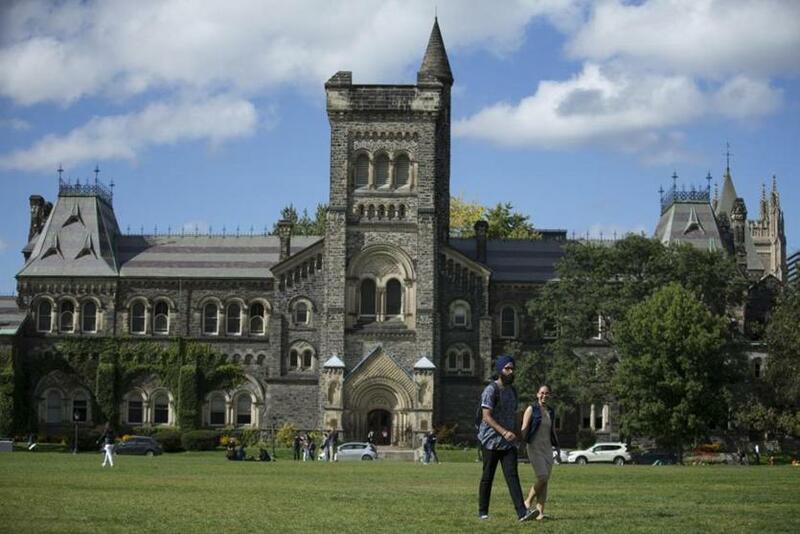 At the University of Toronto, the number of foreign students who accepted admissions offers rose 21 percent over last year, especially from the United States, India, the Middle East, and Turkey. Other universities across the country also saw record increases in the last year. “If you look at the trajectory, clearly Brexit, Trump, things that have been happening in the last year or two — that sense of instability — it’s contributed,” said Richard Levin, the registrar at the University of Toronto, Canada’s most elite university. The increase is not all because of Trump. Canada has made international student recruitment a national goal to spur economic growth. It now has 353,000 international students and wants 450,000 by 2022. But the political uncertainty in the United States — as well as in the United Kingdom — has given Canada’s effort an unexpected boost. Overall, the number of international students in Canada has grown 92 percent since 2008. They now make up 1 percent of the country’s population. By comparison, the United States has about 1 million foreign students and a population ten times that of Canada. The number of foreign students in the United States has been growing for years, but last year it grew at the slowest rate since 2009. Students walked across the lawn in front of the University of Toronto. It is not necessarily the idea of Trump as president that dissuades foreign students from studying in the United States, but the tumultuous climate his election ushered in. High school students in Bangladesh, Ecuador, Iran, and beyond are reading articles about the country and it concerns them. Even before foreign students arrive in Canada, many find it more welcoming than the United States. The paperwork to obtain a study permit is simpler, they said, and unlike in the United States, they can stay and work in Canada for three years after graduation. They also have access to the country’s national health care system. Once the students arrive, they tend to feel at home in diverse Toronto, a city of 2.8 million where half the population was born outside Canada. It’s normal to see people in head coverings or hear people speak with an accent. Real estate prices in Toronto are skyrocketing, but neighborhoods of all socioeconomic levels are ethnically diverse. Located in the geographic heart of the lakeside city, the University of Toronto campus mirrors that diversity. Philips, from Egypt, said he hasn’t felt the subtle hostility in Canada that he has experienced in the United States or the United Kingdom, the kind he says is hard to describe but present nonetheless. Students from abroad now make up about 20 percent of the University of Toronto’s 71,000 undergraduates. The school wants to keep that percentage steady but diversify the countries they come from. Right now, two-thirds are from China. Cost is another reason students choose Canada over the United States. International student tuition is much higher than the bargain rates Canadians pay, but it’s often still cheaper than in the United States or the same price for a more prestigious program. Canada also allows some students with Canadian family members to pay local rates. An engineering undergraduate program, for instance, costs about $11,707 (in US dollars) per year at the University of Toronto for Canadian students. A nursing degree is around $7,033. Political science is about $5,240. Those same degrees cost about $41,574, $38,446, and $36,842, respectively, for foreign students. The costs do not include housing. A dorm plus a meal plan in Toronto costs $8,000 to $15,000. By comparison, a year of tuition plus room and board at Boston University costs about $67,000. BU is also ranked 11 spots below Toronto on the US News world rankings. Admissions criteria can also make Canadian universities a more appealing option than US schools. Students are not required to submit essays or references or do interviews. The school admits them based only on high school grades and test scores. Most international students from outside the United States do not have to take the SAT. Many international students also have parents with Canadian citizenship or an aunt or uncle in the country, making the international transition easier. That was the case for Maryam Hosseini and Dorsa Fardaei, two first-year Toronto students from Shiraz, Iran. They know the stellar reputation of US colleges, but they have negative perceptions of the country. 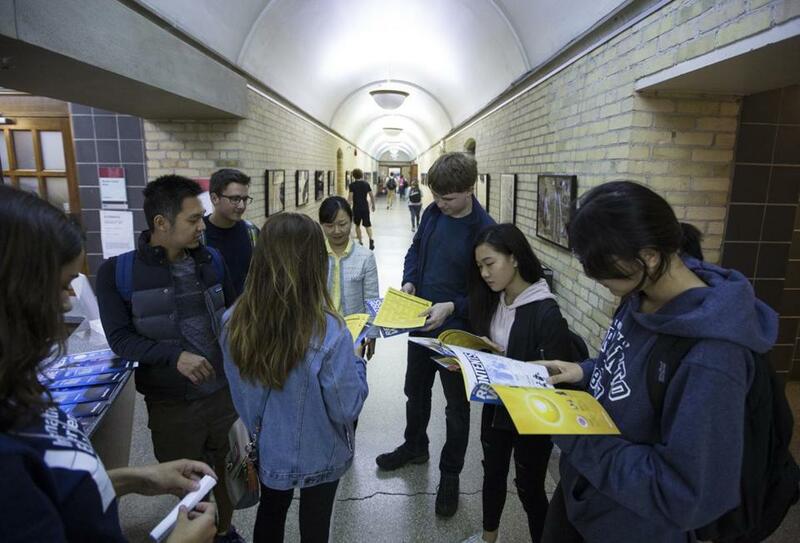 A group of foreign students browsed a brochure while touring the University of Toronto campus. Hosseini completed her last two years of high school in Canada, and in 11th grade she competed in an international math competition in Pennsylvania. She planned to compete again in 12th grade, but by then Trump had been elected and she heard on Canadian radio about hostility toward Muslims in the United States. She stayed home instead. As Hosseini told that story, Fardaei piped up. She has her own US anecdote. Once she was in a New York City airport with her family and some friends. The friends told them to stop speaking Persian so no one would suspect them of being terrorists. “That was really bad,” she said. In Toronto, meanwhile, she said her friends ask her to teach them Persian words. The university has specific strategies to help students adjust. During the first week of school this month, the Centre for International Experience led campus tours for international students, to show them where to sign up for health insurance, where to get study help, and where to find a place of worship or a cheap restaurant. The center’s lobby was lined with students who came to sort out glitches that inevitably arise with visas, health insurance, or class registrations. The day before fall classes started, students paraded through the city streets decked in school colors, then swarmed the campus’s central green for an activities fair with an ice cream truck, bouncy room, and dunk tank. Students from afar were crowded in with those from Canada, all the subject of enthusiastic recruitment for the Mahjong Society, the Immunology Students’ Association, the Korean Outreach Volunteering Association, and other clubs. The scene resembled something from a state school in Florida or Michigan, but at the same time blissfully removed from the tense atmosphere felt on some US campuses. While the Canadian government has seized on recruitment of foreign students — and encouraged them to work in Canada after graduation — as a way to strengthen its economy, US universities have felt compelled to issue public statements assuring such students that they still have a place on their campuses. “We respect people from all nations, cultures, background, and experience and welcome them to join our community,” the president of Bunker Hill Community College wrote in a letter signed by the leaders of all the state’s community colleges last month. Higher education experts in the United States have noticed students avoiding the country, and they are worried. “This has been one of our concerns,” said Esther Brimmer, CEO of NAFSA: Association of International Educators, an organization of educators and recruiters who work to bring international students to the United States. Brimmer sees a direct connection between Trump’s rise and the loss of foreign students. When students go elsewhere, she said, the country loses not just financially but also culturally and intellectually. Ishmam Chowdhury, a second-year Toronto student from Bangladesh, said that for years he imagined he would attend college in the United States, because it is known to overseas families as the best. A degree from a US college, he said, is an automatic resume boost. In the end, though, he chose Toronto. His brother lives there, and the country offers him a chance to stay after graduation and work. “I was also considering universities in the US, but they don’t have that much career opportunities after you graduate,” he said. Chowdhury, who went to a private school nestled in a valley among the Himalaya Mountains, now lives with his brother in an apartment in Yorkville, an upscale Toronto neighborhood dotted with Gucci and Tiffany boutiques. For their parents, the brothers’ education offers hope that they will escape their own political troubles, in Bangladesh. “This is actually like an investment for our parents so that we get to have a life that they didn’t,” he said. Many of Chowdhury’s high school friends went to school in the United States. The friends in New York describe constant protests outside Trump Tower. Friends in Chicago say they don’t feel safe walking in some parts of the city. People on the University of California campuses say US students seem to react to Trump’s every move. Those friends anticipate they will have to leave the United States after graduation, and they aren’t sure where they will go. But Chowdhury and his friends in Toronto look forward to staying to work, and many hope to one day have a Canadian passport. In the meantime, it’s just a relaxed place to go to college, where people on the street and in his classes look like him, or don’t, but it doesn’t matter.